Tarpon schooling on Costa Rica’s Caribbean. As you approach the river mouth at Barra del Colorado for the first time, it appears as if you are about to enter a washing machine gone berserk. The river current pushing out against the incoming waves breaking on the sandbar makes for an interesting combination of a thrilling boat ride that will challenge any Disney attraction. To cross the sandbar, one needs to position the boat as close to the incoming waves as possible and study the series of breakers. The sets will come with big waves followed by a few smaller waves. That´s when you take your shot, quartering the waves until you are on the outside. And there is gold on the other side of those hills – or should I say, silver? Silver Kings, or Tarpon by the tons, swim in acre-sized schools, and once you cross the “bar,” you are usually met with a fairly calm ocean. On the days the waves are just too big to pass, much of the fishing is done in front of the breakers or up the river. Eduardo Brown has been chasing tarpon and fulfilling anglers’ bucket lists for the last 45 years. Not many people will argue with the claim that he is probably the top tarpon guide in Costa Rica. In the recent Club Amateur de Pesca tournament, he guided his team, which included his wife Cynthia, to 17 tarpon the first day. Once Brown is on the outside, he will usually head north, sometimes south, along the coast, always on the lookout for rolling fish. When he locates an area that holds fish, he will either have his clients fish with 1- to 3-ounce jigs depending on the speed of their drift, or send a sardine down.For years, fishing was all done with artificial lures, but several years ago anglers started fishing with bait on a circle hook. Various types of sardines are readily available to be jigged up with small gold hooks. No need to worry about a live well, as they work just as well with dead bait. 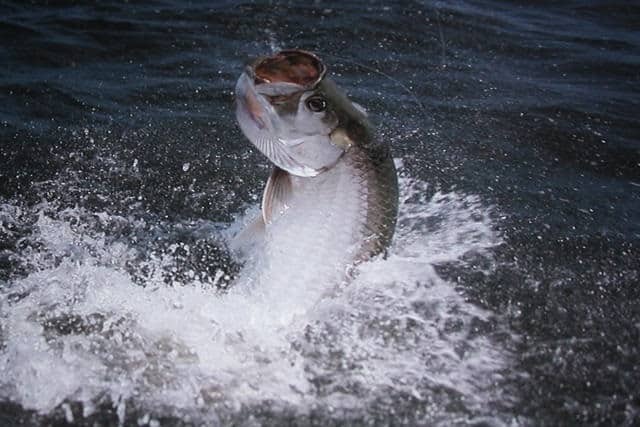 A Costa Rican tarpon will average around 80 lbs, and fish as large as 200 lbs have been taken on occasion. Pound for pound, they are one of the most powerful of game fish and put on a spectacular aerial show. A tarpon takes to the sky. This species has no trouble traversing from saltwater to freshwater; they congregate in large schools in the ocean and in smaller groups and singles in freshwater lagoons, rivers, and creeks. 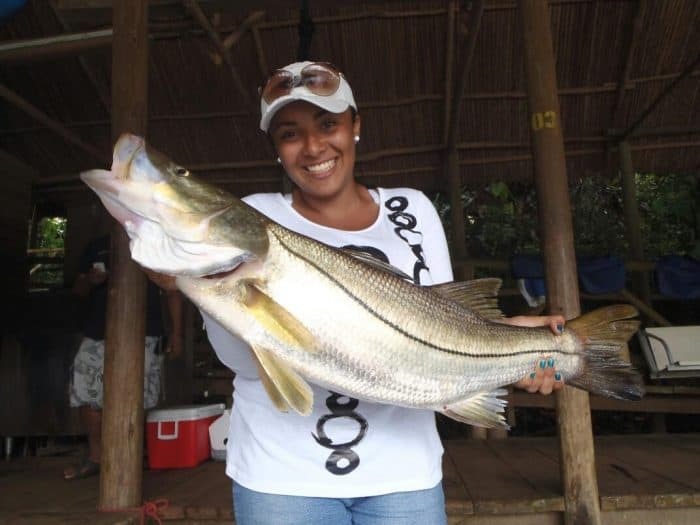 They travel the Colorado and San Juan Rivers from the coast all the way to Lake Nicaragua. Wherever the tarpon might be, Brown will follow them. He fishes the ocean in a 22-foot open fisherman designed particularly for the Caribbean by Pete Magee, who had his boat building operation in Santa Ana, just west of San José. To get into the backcountry, up the narrow creeks in Costa Rica and San Juan del Norte, Nicaragua, he prefers to use a 19-foot Carolina skiff. Brown is also one of the few who have experimented with Caribbean offshore fishing. Sailfish, yellowfin tuna, dorado, barracuda and kingfish have been taken from his boat. He has a special knack for taking large wahoo. Large Rapala lures trolled behind his boat usually takes wahoo that sometimes tip the scale at 60 lbs. And he does it in 125 feet of green water, something a Pacific-coast angler probably would not even fish in, preferring clean blue water. Still, tarpon is his favorite, and he loves taking people to catch their first one. When he doesn’t have a charter, you will find him fishing with his family. Ask anyone slightly familiar with Costa Rican tarpon and they will know the name Eddie Brown. He truly is the King of the Silver Kings.